Jan Traylen: Nature reclaims: A Landscape of Images. Spring growth of ivy crawls up the disintegrating, dumped car, drawing it back to the earth. The image is slightly desaturated with emphasis on the greens. Giclée printed photograph on natural white textured 315gsm paper. 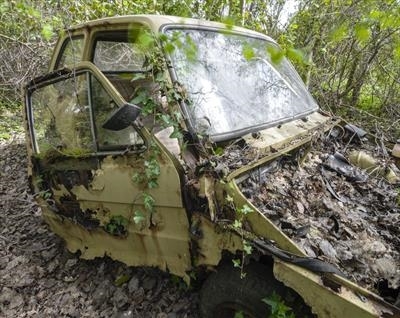 Spring growth of ivy crawls up the disintegrating, dumped car, drawing it back to the earth. Fallen leaves gather and bury the abandoned vehicle. Giclée printed photograph on natural white textured 315gsm paper.